Thanks to movies like The Big Short, many readers might be familiar with the causes and key events of the 2008 Global Financial Crisis. Along with other examples like Too Big to Fail and Inside Job, The Big Short not only dramatized the actions of investors who foresaw (and ultimately profited from) the crisis, but also explained why the crisis happened in everyday terms. But most readers—especially those from the West—may not know that a financial crisis nearly crippled Asia in 1997. With a new movie called Default (also known as Sovereign Default), Korea aims to give the 1997 Asian Financial Crisis a Big Short-style cinematic treatment. Throughout the early 1990s, numerous Asian countries made poor investment decisions due to easy access to debt, creating an economic bubble (similar to the US before 2008). In 1997, this bubble popped, first in Thailand, and then in other countries—including Korea, where an excess of foreign currency debt caused numerous bankruptcies. Notably, major car manufacturer Kia Motors had to ask for a government bailout—just like certain US car companies during the 2008 Global Financial Crisis. A self-defeating cycle ensued. Declining confidence in financial markets led Korea’s currency, the won, to lose value. This made it harder for Korea’s companies and government to pay back foreign debt—causing the won to lose even more value. To stop the cycle, Korea ultimately accepted a US$58 billion bailout from a consortium of global powers called the International Monetary Fund (IMF). That bailout imposed significant policy overhauls, which weakened employment laws and imposed austerity measures. Default’s story begins in November 1997, as negotiations begin with the IMF about bailout terms. Amidst Korea’s declining economic environment, the film introduces three parallel stories. First, we meet a factory owner named Gap-su (Huh Joon-ho). Gap-su wins a contract to supply metal bowls to a big department store, but the store pays him with a promissory note (an “I Owe You” between businesses) — unknowingly exposing himself to the risk that his customer won’t be able to pay him. This backfires when the department store goes bankrupt, leaving Gap-su without the funds to pay his suppliers. 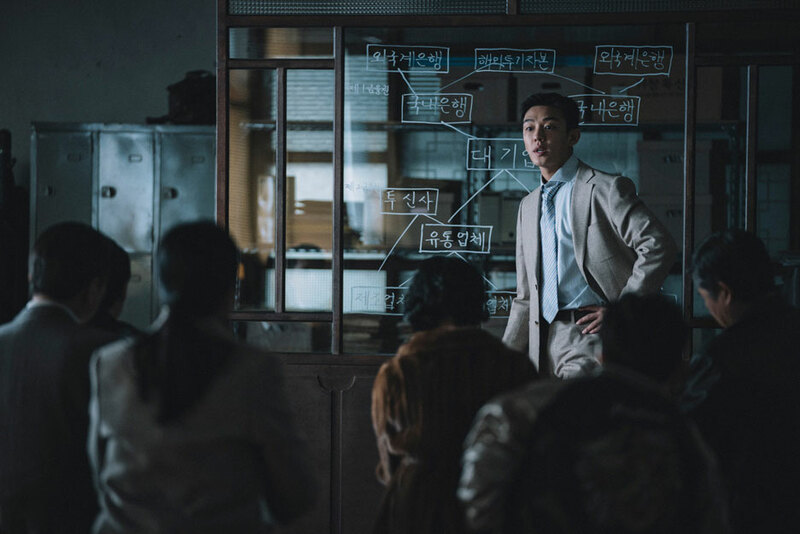 Meanwhile, a young financial analyst named Jung-hak (Yoo Ah-in) hears stories on the radio about families in distress—particularly those selling their homes below market price to pay bills resulting from small business bankruptcies. Seeking to profit from this situation, Jung-hak sets up his own investment fund to bet against the Korean economy. Finally, the governor of Korea’s central bank reads a report from his head of monetary policy, a woman named Si-hyun (Kim Hye-soo). Si-hyun’s report concludes that Korea will run out of foreign reserves to defend the Korean won’s artificially fixed exchange rate against the US dollar within a week. This triggers an emergency meeting of top government officials, who must defend the Korean economy from collapse. These three stories allow us to view the 1997 financial crisis from different perspectives. Si-hyun’s story shows how the government acted during the crisis, Jung-hak’s narrative frames the downturn in economic terms, and Gap-su represents millions of real Korean small business owners who suffered in 1997. At each of these levels, Default embodies the trauma resulting from the crisis: we see characters desperate to sell their homes, drowning their sorrows in soju, and even committing suicide. One of the reasons The Big Short was a hit in the US is because it used accessible popular culture references to explain the complex fundamental causes of the 2008 recession (one notable scene has Margot Robbie explaining finance terms in a bathtub). This allowed viewers to become more invested in the narrative without tuning out, since concepts like “current account balance” or “foreign reserves” are not commonly used on a daily basis outside the world of finance. This is where Default falls short, however. Instead of helping viewers learn about intricacies of the 1997 financial crisis, Default glosses over economic details and relies heavily on personal drama. Though there’s one admirable scene where financier Jung-hak explains aspects of the crisis on a chalkboard, Default doesn’t go as far as The Big short in offering friendly explanations. The movie instead focuses more on bridge jumpings and expressions of national pride—including many scenes where the IMF is portrayed in an extremely negative light, as an agent of American business interests. The IMF’s bailout did indeed come with a set of harsh terms that may remind many Europeans of the “austerity” imposed by the European Central Bank after the 2008 Global Financial Crisis. From weakened labor laws that ended “employment for life” in Korea, to asking citizens to donate their gold to bailout the Korean Central Bank—the scars of 1997 are still sharp in the minds of those unfortunate enough to have experienced the crisis during their adult lives. Similar to certain films about the 2008 Global Financial Crisis (e.x. Inside Job), Default also criticizes the government for prioritizing the interests of big businesses (i.e. chaebol conglomerates in Korea) over the interests of smaller businesses and common citizens. After all, the chaebol held (and still hold) close relationships with Korea’s government, and were ultimately “too big to fail”—much like America’s major financial institutions in 2008. Of course, there is unresolved economic controversy about whether austerity measures and bailouts of large enterprises ultimately saved the global economy in both 2008 and 1997, or just served to widen economic inequality. However, Default loses these nuanced discussions among appeals to emotion. In particular, the drama between Si-hyun and her male colleagues (who disrespect her because she is a woman) feels excessive. Aside from one scene where Si-hyun eloquently explains to everyone how IMF policies are actually thinly veiled American imperialism, she seems to act as an highly emotional foil to the rational (and male) decision-makers in the Korean government—reinforcing the untrue stereotype that women are overly emotional. Perhaps Director Choi Kook-hee would have done better to keep Si-hyun’s dialog to economic facts, instead of impassioned pleas. However, despite the fact that it frequently bypasses economic education for dramatic licence, Default is still a relatively good introduction to an oft-forgotten (at least in the West) financial crisis. 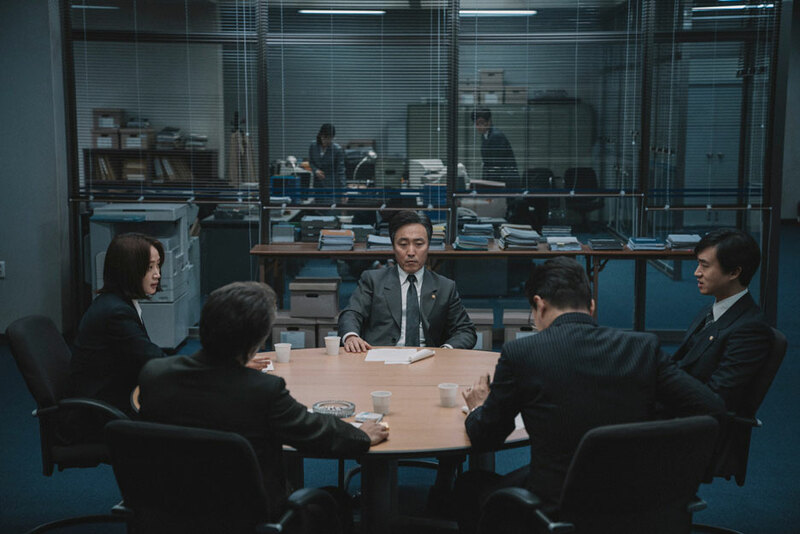 If anything, Default’s focus on emotions helps convey the very real traumas that Koreans still feel about the 1997 Asian Financial Crisis, something that international viewers might not initially know about. Default also conveys numerous lessons that viewers around the world will still find relevant. As trade wars rage in the US and populist sentiment leads to events like Brexit, it’s worth looking back to the events of 1997 to see what sparks such phenomena. Though we still might need more movies that dive deeper into the the Asian Financial Crisis’ exact causes and details, Default is a great starting point when it comes to helping people who are not economists realize the importance of what happened in 1997. Default (Korean: 국가부도의 날 )—South Korea. Dialog in Korean. Directed by Choi Kook-hee. First released Nov 28 2018. Running time 1hr 54min. Starring Kim Hye-soo, Yoo Ah-in, Jo Woo-jin, Heo Joon-ho.